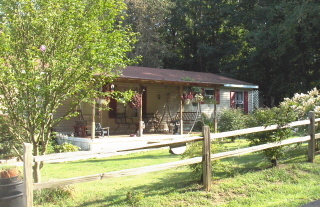 A Redneck Garden in August – Johntheplantman's stories, musings, and gardening. Bud checks out the rabbits across the road. 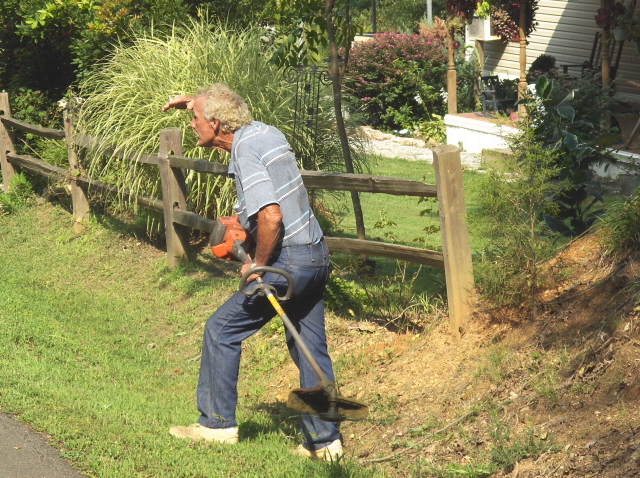 We talked a few minutes about how he should prune his ten foot tall and wide knockout rose, and then, he said, “bring that there camera down back and I’ll show you my real garden.” We walked around the house and I saw the vegetable garden at the bottom of the hill. 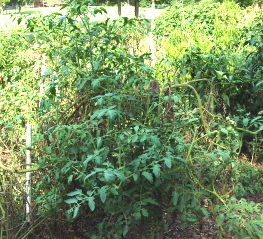 It is about a 30 by 30 foot area prepared by using cross ties and filled with a good compost I had gotten him a couple of years ago. 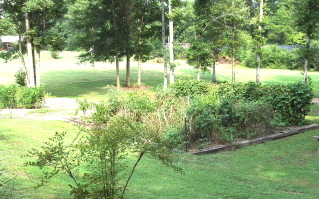 I looked down the hill at the raised vegetable garden. 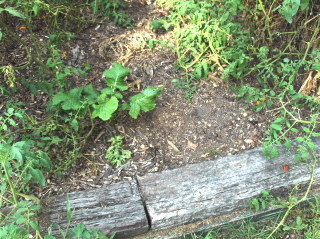 Crossties hold in the compost. Note the mulch of wood chips. Beans. Blue Lake Runners produce until they freeze if you keep them picked. Tomatoes will keep producing all summer if you keep the tomatoes picked. 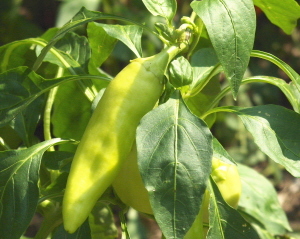 Sweet banana peppers are an essential for chow chow. 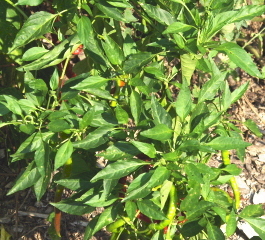 I saw some young okra plants and was told that they would probably produce a crop of late okra if the heat held up. 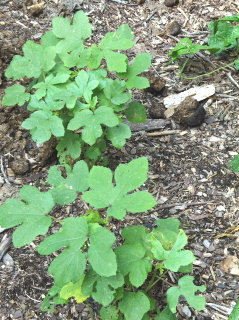 Young okra plants in August. Bud had given me a carton of “aigs” not long ago that looked like Easter eggs. They were all kinds of different colors and almost too pretty to eat. When I cooked them and ate them, they didn’t taste the same as the ones from the grocery store. Bud has fresh eggs all the time. 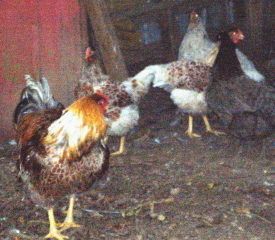 The chickens were hiding in the shade. 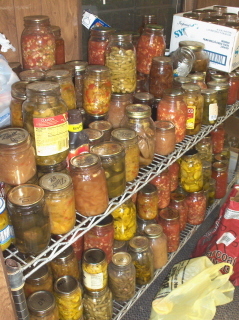 I got to thinking and I asked, “What do you do with all of the produce? We’re talking a lot of food here.” He grinned and took me to one of his sheds. I walked inside and looked around. I was impressed to say the least. 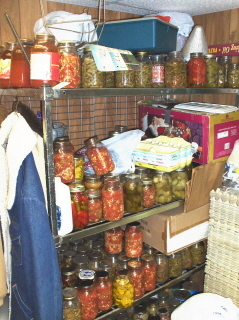 I couldn’t believe the racks of preserved vegetables and fruits. 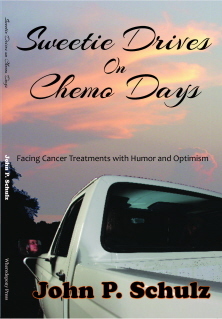 Bud grinned and said, “remember the other day when I told you about all them catfish me and the grandyounguns caught up in the pocket? 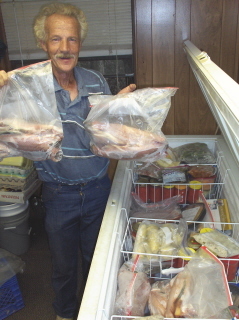 Lookie here.” He opened the freezer and showed me bag after bag of filleted catfish. “We’re gonna have us one more fish fry one day pretty soon.” The freezer was packed with meats and vegetables from the current season. The front porch is graced by a pair of almost welcoming cement dogs. 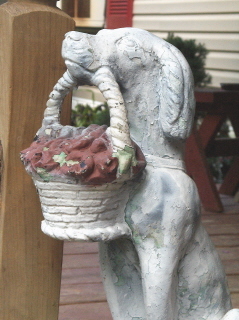 I kind of liked the idea of a big old dog bringing momma a basket of flowers. 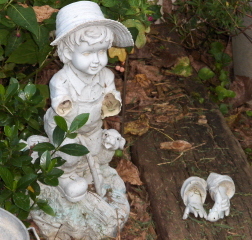 I hope you enjoyed the garden tour. This garden shows that all you need is some scrounging ability, a little hard work, and a big grin to be successful with your garden. Nathan and Rachel learn how to start a bonsai. I love this and am glad to see Bud back. This is a wonderful blog! Of course I am a fan of Bud’s anyway and share his love for growing things. Tell him that my favorite beans are Blue Lake and I can’t find them in the store. 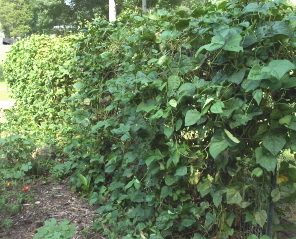 When I lived in North Carolina and had a good garden, Mary and Jos built frames for my beans so I wouldn’t have to bend over. Sure wish I had some now! I miss my garden and appreciate visiting Bud’s. Thank you! I had no idea Bud has a garden just a few yards from our house… very nice!